The boy cowers in the dirt and for an agonising second, the bullock is directly above him. As it bucks skyward, there is something violently beautiful about the streamline curve of horn to hoof -- the immense muscular piston of a hind leg coiled with power and the fragile human form below. The bull falls heavily, missing the boy by a millimetre. He stands, all skinny wrists and ankles, and flashes a big grin to the crowd as he jumps the fence to safety. In the aboriginal community of Warmun, WA, it’s kids day at the annual rodeo. Tomorrow is the main event where local men -- and one bold woman -- will ride bucking bullocks and horses against the Kimberley rodeo circuit riders. But today, the whole community is out to watch these five-year-olds strap onto a raging little bullock and hold on as tight as their skinny fingers can manage. Past the rodeo grounds, a savannah plain stretches for kilometres to a red rock escarpment that catches the afternoon light. Boab trees cast bulbous silhouettes and whistling kites circle with the hot eddies above. Behind the makeshift rodeo ground is collection of cul-de-sacs, borrowed from a universal suburb design manual, where 400 people live. The cul-de-sacs are named Top Camp, Middle Camp, Bottom Camp and, simply Other Side. Aside from two petrol stations, there is no shop for a two-hour drive but today, Warmun feels like the centre of town as people clamber on top of Landcruiser 'troopies' and fences to get the best view of the action. A lanky little kid dressed vaguely like Elvis swaps his cap for a stack hat and walks timidly towards the stalls where the next bull is virtually climbing the walls. Its hooves clash against the metal, making the elders’ eyes gleam with memories and dust. For the old men and women in the community, this is no American yee-haw tradition -- it’s a part of their history. The Warmun elders Rusty, Gordon, Patrick, Churchill and more sit in their Akubras with shiny belt buckles and RM Williams boots, which is as much a part of their contemporary culture as the Gija aboriginal roots that define them. Many of the elders were born on stations in the surrounding Kimberley country, often beneath a tree that they can point out if you care to take them there. Some trees bear memories of murder. Springvale Station, Mabel Downs, Texas Station and Lissadel Station are the names their ancestral lands have become known by. It’s with a melancholy and joy that the old men remember their station days. They were indentured workers where the men broke horses, walked bullocks to Wyndham port 250km away and toiled their ancestral land for little to no pay. The women worked in the station homes, milking nanny goats and cleaning homes. There were bad station masters and good station masters, and every elder’s experience was unique. One thing was shared though -- they took fierce pride in their cowboy skills and told stories of being together at night, on their ancestral lands and, singing into the darkness. But in 1968, a well-meaning legislature demanded Aboriginal workers be paid the same as Anglo Saxons. Almost all Aboriginal workers in the Kimberley were kicked off the stations -- their ancestral land. Homeless, penniless, jobless and dislocated from the land they felt they were born to protect, Warmun became a place where people went who could not go home. 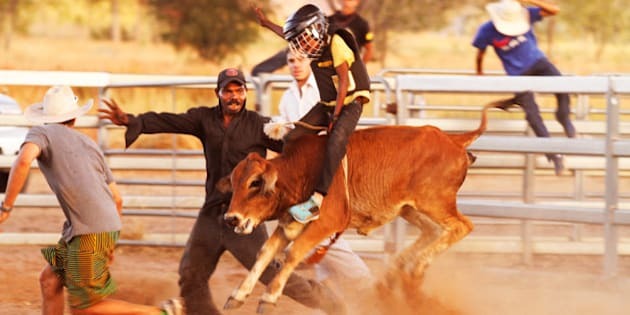 It’s been five decades since, so when the elders see a plump five-year-old jump on a bull, they’re seeing their own stories of land and country taken on by a new generation, with new opportunities. If travel is about having cultural experiences that push your perceptions and show you something astounding, sometimes the most foreign and compelling experiences come from within your own country. Keep a look out for rodeo events in the Kimberley.